Because we have whole carcasses of pork beef and lamb, we are able to offer all cuts of meat, including more traditional cuts, offal, this also means we have bones available, perfect for pets and for making stock. Ox cheek is more of a continental cut - traditionally used by the French, for braising, trimmed with all the fat off. Very strong flavour - needs good slow cooking. Traditionally a cheaper stewing steak for dicing - but mostly used for mincing now. Makes a fantastic flavoursome lean mince with great internal fat... excellent for burgers. A good (and slightly cheaper) alternative to top / rump mince. Chuck is traditionally excellent for dicing and also makes a great mince with fantastic flavour. There are actually two blades - round blade and featherblade. Round blade can be diced, but makes an excellent braising steak. Featherblade - in my opinion one of the best braising steaks. Sliced through and cooked properly as a thick dobe of beef, is one of the most flavoursome bits of meat you can get. Slow-cooked for 4-5 hours... amazing! Was traditionally a cheaper alternative to a forerib roast, to be roasted on the bone or pot-roasted on the bone, but is more often used for mincing these days. A very American dish is a 'beef short rib', which we call a 'Jacob's Ladder' - great for barbeque beef, braising for a three to four hours in sauce. The meat has that delicious taste of a rib of beef with the right amount of fat that keeps it moist during long cooking. Very tender. Entrecote, sirloin, porterhouse... some of the best known steaks come from this part of the animal - the frying steaks. There is no internal fat, and the meat is much leaner but also very tender. Traditionally, there is also sirloin on the bone, which gives a great flavour for roasting or frying... or with the bone removed as a Boned and Rolled Striploin. The fillet - the the tenderest and leanest cut of Beef - runs on the inside of the sirloin down to the rump and is cut into Fillet Steaks. The top part of the Fillet is the Chateau Briande which is a fantastically lean and flavoursome cut. Traditionally served on the bone, but more often served boneless these days, cut into steaks. We remove the top cap of the rump, so the resulting single-muscle Square-cut Pave Rump Steaks do not fall apart. Despite the inconsistency in texture, this is a very lean meat, but can be tougher than the other steaks. Brisket, part of the flank - is used as a flavoursome cut in Chinese cooking, but is also often used for mincing and barbequeing. Salt brisket is (in my opinion) the best for salted beef. Traditionally a five-bone roast, but most often in modern butchery, the eye of the forerib is removed and it becomes ribeye steaks. You also get cote du boeuf steaks, ribeye on or off the bone. We do supply the forerib as ultimate beef roast - a five-bone French-trimmed rib of beef - which for the 'wow factor' at a dinner party, cannot be beaten. Fabulous marbled fat through the meat, with great flavour. 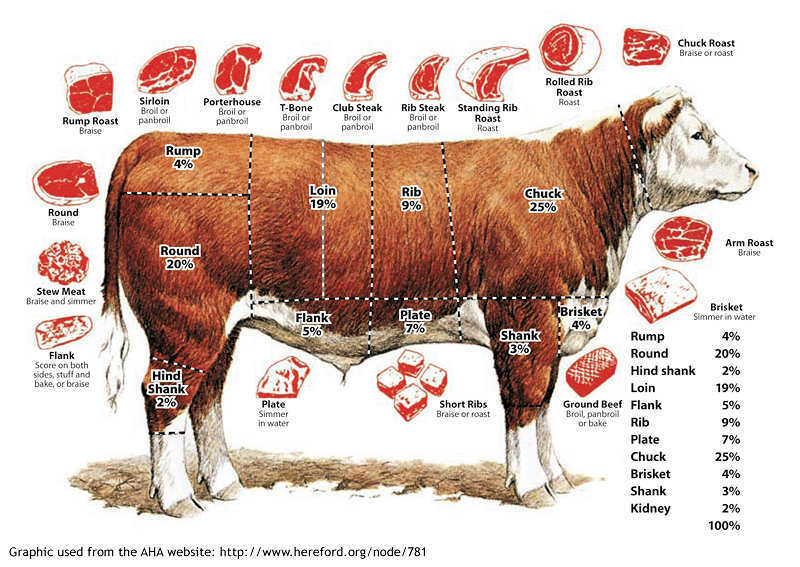 This can be cut down to make a Bone-in Ribsteak - a huge portion for 1, or for 2 people to share. Definitely "the man's choice" for a steak. Traditionally, a roasting joint or salted for a classic salt beef. A two-joint muscle, external fat is added to add flavour to it as a roast. Slightly tougher texture than a sirloin or forerib roast as it is a worked muscle, but still plenty of flavour. Traditionally, a roasting joint - cut and tidied. Good for stir-fries, beef stroganoff, good for quick frying in strips at the cheaper end of the scale. Slightly tougher texture than a sirloin or forerib roast as it is a worked muscle, but still plenty of flavour. Mostly used for mincing - makes a very good lean mince, called "top rump". Leg of beef is a two-muscle cut - sliced through for braising, it has to be cooked for a long time to soften the internal gristle, but has got great flavour when cooked properly. A flavoursome part of the animal, but requires long cooking time to fully tenderise the meat and release the flavours. Oxtail, braised, is loaded with flavour. Aside from the classic oxtail soup, many high-end restaurants will often put oxtail with a more expensive cut like a fillet because of its deep flavours.